Looking westward toward the Airport Expressway (Florida 112) as it begins a four mile trek to Miami International Airport. A mixture of ramps join the Airport Expressway (Florida 112) with the North-South Expressway (I-95) and I-195 east to Miami Beach at the 36th Street Interchange in midtown Miami. Photo taken March 26, 2006. The Airport Expressway (Florida 112) is a six- to eight-lane freeway from Miami International Airport (MIA) east to Interstate 95 and Interstate 195 for a distance of 5.4 miles. It is maintained by the Miami-Dade Expressway Authority. The freeway parallels NW 36th Street for its entire length, which runs to the south of the expressway. The Airport Expressway continues east of Interstate 95 as Interstate 195 (hidden Florida 112) to Miami Beach. Florida 112 was originally named the "36th Street Expressway", based on the concept that the new freeway would replace parallel U.S. 27 (NW 36th Street) as the through route. In 1967, Florida Legislation designated the freeway as the Robert Frost Highway, named after the famous poet who resided in Miami upon his death. However, neither name remained and is more commonly known as the Airport Expressway, or simply the "112". For those who follow the specific road numbering grid system used in Florida, the Florida 112 designation does not fit at all into the existing system. (See the Florida State Road Numbering System page for more information.) Florida 112 lies between Florida 80 and Florida 90 (U.S. 41), so the logical assumption would have been a state road number in the 800 series (like Florida 836 for the Dolphin Expressway). However, the Florida 112 designation was created early in the process, and was left in place even as secondary routes were renumbered in the 1970s and 1980s. 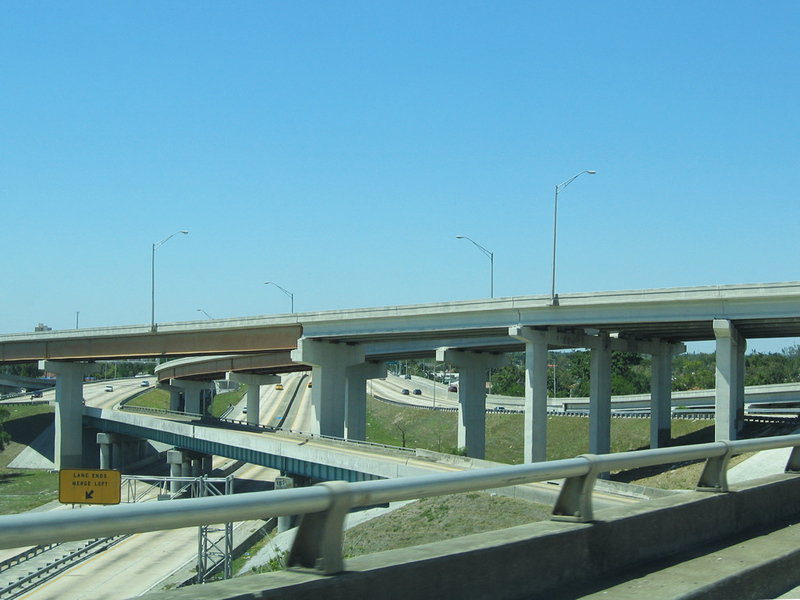 The Airport Expressway was constructed between 1959 and 1961 along with connecting sections of Interstate 95 (North-South Expressway) and Interstate 195. Its interchange with the two respective Interstates is a three-level stack locally referred as the 36th Street Interchange. The freeway opened to traffic on December 22, 1961, connecting the airport with Miami Beach. Florida 112 was constructed in a heavily urbanized area, and the resulting freeway displaced many existing homes and businesses, as its path took up an entire block between NW 39th and 40th Streets. Additional plans had the Airport Expressway extending west from Le Jeune Road (Florida 953) to the Palmetto Expressway (Florida 826), but legal issues ensued on a proposed crossing of the Florida East Coast rail lines to the west of the airport.1 Plans for the extension were ultimately shelved as a result of the legal impasse. The Airport Expressway was tolled only in the eastbound direction between 1983 and 2014 with a toll gantry located between NW 17th and 12th Avenues. With Open Road Tolling (ORT) being implemented along Florida 112 in 2014, tolls are once again being collected in both directions. Originally, Florida 112 had toll plazas in both directions but increasing traffic prompted westbound toll collection to be lifted in March 1983. The eastbound toll was increased from ten cents to a quarter to make up for lost revenue. The physical toll booths were removed permanently a year later, in March 1984. Tolls were also lifted along westbound Florida 836 (Dolphin Expressway) to the south during the same time period. In 1987, Florida 112 (Airport Expressway) was widened from six to eight lanes between Interstate 95 and NW 22nd Avenue. Flyover connector ramps to and from I-95 were also added in 1987 as part of the installation of high occupancy vehicle (HOV) lanes along the North-South Expressway. These HOV lanes were constructed on Interstate 95 between 1986 and 1990 through midtown Miami, and opened to traffic on December 12, 1990. Today the flyover connector ramps link to the tolled I-95 Express Lanes which consist of the former HOV lanes between Downtown and the Golden Glades interchange. Originally, Florida 112 and the Airport Expressway terminated at the intersection of Florida 953/NW 42nd Avenue (LeJeune Road) and U.S. 27 (Okeechobee Road) just north of the airport. As a result, airport traffic had to use busy LeJeune Road to connect with the expressway. Constructed between December 1988 and March 1991, a pair of two-lane ramps were built to take motorists from the end of the Airport Expressway directly to the entrance of Miami International Airport. In December 1994, the Miami-Dade Expressway Authority (MDX) was created, and two years later the Florida Legislature allowed MDX to assume operational and financial control of five expressways from FDOT: Florida 112, Florida 836 (Dolphin Expressway), Florida 874 (Don Shula Expressway), Florida 878 (Snapper Creek Expressway), and Florida 924 (Gratigny Parkway). In 2000-2001, MDX replaced the standard state road shields on the toll expressways with the "TOLL" shields found throughout the rest of Florida. In 2009, MDX began implementing Open Road Tolling on all of its expressways, culminating in 2014. Background information for SR 112 was originally researched by Justin Cozart and Jason Learned and posted on TropicalTurnpikes.com. Information here was reproduced with permission by Justin Cozart. "Expressway Linkup Still Snarls on Legality", The Miami News, September 23, 1962.